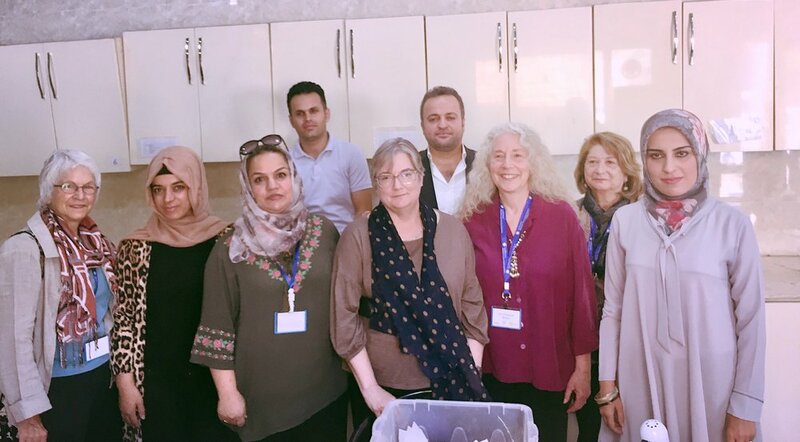 In September, TARII brought together the Advisory Council for the Iraqi Institute for the Conservation of Antiquities and Heritage (IICAH) in Erbil, Iraq. It was funded by the National Endowment for the Humanities (NEH) and implemented by TARII with the help of the Smithsonian Institution. This was the first Advisory Council meeting in 5 years, the last being in 2013 due to Daesh entering the area in 2014. TARII was excited to bring the Council together (from around the US and Iraq) to discuss the re-advancement of the Institute. The American Academic Research Institute in Iraq (TAARII), now operating as The Academic Research Institute in Iraq (TARII), maintains a mission to promote scholarly research on and in Iraq and to strengthen relationships between Iraqi and American scholars and institutions. Conference Report: "Living Heritage in a Middle East Conflict"
TARII: though our name suggests that we are a research institute “…in Iraq,” it has been difficult to establish this fact since the fateful events of 2003. Only few of our members have been able to visit the country, and our fellowship program can only fund U.S. researchers who work on, but not in, Iraq. The project funding for Iraqi researchers in Iraq is TARII’s pride, but only few Iraqis could secure a visa for travel to the U.S. Stateside, legal restrictions, the all too real threat of violence, but also perceptions about insecurity have led to an entire generation of Iraq scholars writing about Iraq without field experience, with exceptions few and far between. First contact, overcoming reservations, putting feet on the ground, and meeting people were therefore very good reasons for me to undertake a trip to the north of Iraq to participate in a conference-workshop on “Living Heritage in a Middle East in Conflict,” organized jointly by the Institut Français du Proche Orient (IFPO) in Erbil and the American University of Iraq in Sulaimaniye (AUIS). The conference took place on the impressive premises of AUIS from May 10 to 11, 2016. Particularly interesting were presentations by AUIS professor Edith Szanto about the “rediscovery” of Zoroastrianism among the Kurdish youth as the “original” Kurdish religion as push-back against the rising threat of militant Islamism, by former TARII fellows Bridget Guarasci on the pitfalls of post-Saddam reconstruction discourses as exemplified by the Iraqi Marshlands, Mosul archeologist Leila Salih’s discussion of the re-purposing of lost heritage site in her home town, former TARII fellow Abdulameer Hamdani’s stock taking of the disappearance and dispersal of Iraqi ancient heritage since 2003, and Thomas McGee’s fascinating account of debates in the North Syrian Kurdish city of Kobane about the re-construction or memorial preservation of the destroyed city center after Kurdish troops re-took it from Daesh in 2015. Accounts of the impact of the Syrian Civil war on cultural and social heritage were particularly chilling (Mustafa Ahmad, Mohamad Aljasem, Vanessa Guéno), while other presentations focused on possibilities of reconstruction, both materially and socially (Diane Duclos, Jala Makhzoumi). Conference organizers Géraldine Chatelard, Elizabeth Campbell, and Boris James steered questions and answers to cover issues related to political, legal and scholarly dimensions of the definition of heritage, and what the international heritage discourse can do to the life of communities. Interesting contributions to the discussion included Saad Eskander’s remark that it should not be forgotten that heritage destruction pre-dated the 2003 invasion and Daesh. Great parts of old Baghdad had fallen victim to Ba‘thist development plans, long before 2003. Altogether, the conference offered crucial insights to the variety of challenges that cultural heritage activists and practitioners are facing. The conversation is ongoing. After a dinner of Kurdish barbecue in a café at the foot of the citadel, I departed to the airport. Different from the makeshift terminal hangars of the international airport of Sulaimaniye, the Erbil facilities are built to impress as this is supposed to be a shiny new gateway to and from what was once meant to be a new Dubai in Iraq. That dream has fallen victim to the decline in oil prices, the corruption and the mismanagement that have left the economy of the Kurdish region of Iraq a shambles. Inner-Kurdish conflicts linger under the surface, but one can sense the people’s pride and resilience as well. Observations and impressions of a short visit remain superficial, but hopefully the establishment of closer links between TARII and the scholarly communities of all of Iraq will open channels for beneficial cooperation and mutual learning in the near future.